Dr. Terri Morris at glowMD Laser MedSpa at The Dermatology Center offers CoolSculpting. We are proud to state that we are the only practice in Fredericksburg and surrounding counties for years too offer CoolSculpting. We have performed over one thousand cycles resulting in many happy patients! We exclusively offer multiple machines to treat patients in half the time at our Center. CoolSculpting is nationally recognized as the best non-invasive technology for fat removal. It is a revolutionary body sculpting procedure that effectively reduces fatty bulges using a controlled cooling method. CoolSculpting is FDA approved for non-surgical fat removal by freezing the fatty areas of your body for body sculpting, such as the abdomen, flanks, thighs, arms and even the chin with the new CoolMini and is completely noninvasive. The innovative fat-freezing technology makes it one of the most effective and state-of-the-art fat reduction options available today for men and women! CoolSculpting is, by far, the leading noninvasive fat reducing technology worldwide, with over 5 million treatments safely delivered. Twice the Ice, Half the Time! Exclusively at glowMD Laser MedSpa, we now have an additional CoolSculpting® machine, so we can treat more than one area at a time – known as Dual-Sculpting! Now, you can get twice the fat-reduction results you would in just one treatment time. For example, if you’re undergoing CoolSculpting® of the flanks or arms, we can treat both flanks or arms at the same time rather than treating only one area and then the other. Dual-Sculpting cuts your treatment time in half, letting you get back to your busy life and saving you valuable time while still receiving all the benefits of CoolSculpting®. We are the only certified center in Fredericksburg to offer Dual- Sculpting. This allows for maximal body contouring to be performed in one session. The answer is yes and here’s why! The CoolSculpting procedure is the world’s # 1 non-surgical fat reduction treatment. Our bodies convert excess calories into fat, which is then stored in fat cells. Fat cells are basically microscopic storage containers for fat. 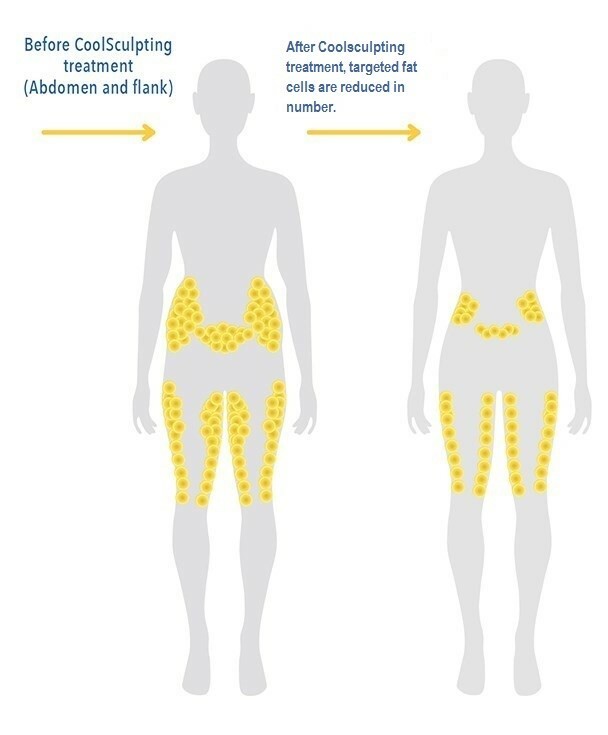 Fat cells do not divide, regenerate or move from one spot on the body to another. CoolSculpting results in a decrease of the amount of perky fat cells in the body, resulting in an improved contour (although individual results may vary). 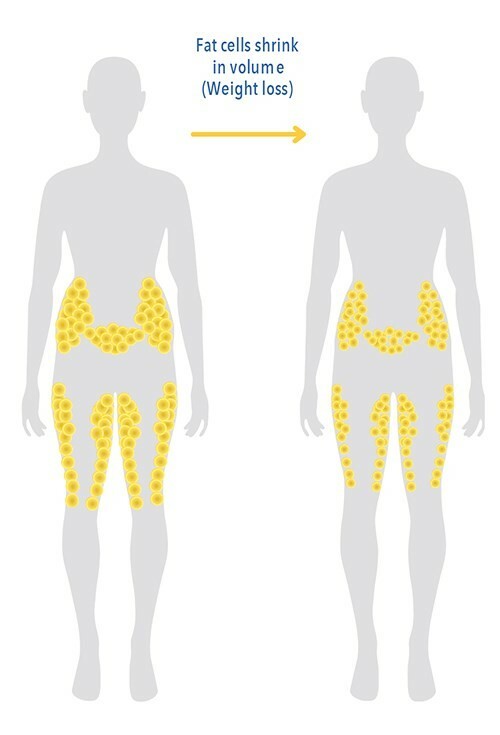 When we gain or lose weight, our fat cells grow and shrink depending on the amount of fat being stored. A fatty bulge exists because it is an area where there are relatively more fat cells. (This is genetically predetermined. Ugh. Thank you mom and dad.) It is for the reasons above that it is simply not possible to spot reduce fatty bulges with diet or exercise. Weight gain will increase the size of the remaining cells throughout the body, but the contour change produced by the treatment will remain the same. CoolSculpting treatment sessions involve the placement of an applicator over the treatment area. There are multiple types of applicators that �?pinch’ the area and, using suction, hold the bulge of skin and fat in place while freezing the tissues for a certain length of time depending on the applicator and location. These applicators come in different shapes and sizes to conform to the different body areas to be treated, including the waist, abdomen, arms, and inner thighs. It’s easy to sit back, relax and say goodbye to stubborn fat. After we select the area(s) to be treated, the device is positioned on your body and controlled cooling is applied. During your procedure, you may choose to read, check email, or even take a nap. A single CoolSculpting treatment typically results in a 20-25% reduction in the fatty area treated. A slimmer contour is generally noticeable as soon as 4 weeks following treatment. Total results noticed in 12 weeks. What Can I Expect After a CoolSculpting Treatment? There are absolutely no restrictions on activities following treatment. One may expect the treated area to feel numb to touch for a period of 2-4 weeks. This will go away on its own. Occasionally, the pinching type of applicator might create a small bruise (because of the suction, like a hickey) which will go away within days. A small minority of patients will experience discomfort and/or some swelling in the treated area; this too resolves within 7-14 days and generally requires no treatment at all. Best of all, a reduction in fatty bulges is typically seen in just 4-6 weeks after your CoolSculpting treatment. Get The Skinny on CoolSculpting! 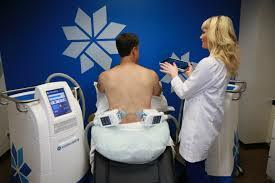 CoolSculpting was initially developed by two Harvard scientists, Dr. Dieter Manstein and Dr. Rox Anderson. They observed the basic biological fact that fat cells are more vulnerable and sensitive to cold injury than the other cells around them (skin, muscle, nerve, blood vessels). The two doctors were both familiar with a strange phenomenon known as “popsicle panniculitis”, which has to do with the loss of cheek fat that occurs while sucking on a frozen Popsicle. Their observations led to the development of CoolSculpting technology, now owned and produced by the publicly owned company, Zeltiq, based in Pleasanton, CA. If You Are Interested in CoolSculpting, What is the Next Step? The next step is to call glowMD Laser MedSpa at 540-371-9098 and schedule an evaluation. At that time we will advise you whether you are a candidate for this procedure, and what other possibilities exist for improving your appearance. We are committed to ensuring your satisfaction, your comfort, your privacy, and your safety! We offer financing with Care Credit. Apply on line! Its quick and easy! You’ve heard how great CoolSculpting can be, but you may be wondering: “what about laxity? Can CoolSculpting improve the appearance of lax tissue?” When it comes to a double chin, the answer is “yes,” as the FDA has cleared CoolSculpting to improve the appearance of lax tissue in conjunction with treatments for submental fat (double chin). In an 18-week clinical study of the submental area (aka double-chin), CoolSculptingwas proven to improve the appearance of lax tissue in more than ¾ patients in the clinical trial. Investigators found that 77% of patients visibly showed improved tissue laxity. Plus, 75% of patients reported their chin looked more toned after treatment.Think of CoolSculpting as the double approach to a double chin because it offers fat reduction plus the improved appearance of lax tissue!77% of patients visibly showed improved tissue laxity.75% of patients reported their chin look more toned. The CoolSculpting fat reduction treatment is essentially non-surgical controlled cooling of fat cells. The procedure destroys fat cells by way of Cryolipolysis ® (aka “freezing the fat”) and reduces fat in the treated area by about 20%…without damage to other tissues or structures. The result? Once treated fat cells are gone, they are gone for good! Find out if you’re a candidate for the fat freezing treatment today. Have an in-person consultation with us at glow MD Laser MedSpa and let us provide an assessment and estimate for CoolSculpting! At your consultation, you can discuss the areas you’d like to address and your treatment goals. CoolSculpting is cleared by the FDA for eight body areas, safely and effectively reducing subcutaneous fat in the flanks (“love handles”), abdomen, thighs, submental area (under the chin), back, bra area, underneath the buttocks (banana roll), and upper arms. And now it’s also cleared to improve the appearance of lax tissue in double chin treatments! Not ready for a 1×1 consultation? Send us your email address and we will notify you when we have our next CoolSculpting event. You can attend our Cool Eventto get a no-commitment assessment in a fun environment. Call us at 540- 371-9098, or email us at dermcentermarketing@gmail.com to receive the invite! "I'm partnering with CoolSculpting because I love that it gives people the ability to feel better in their own skin and doesn't require major surgery." "I never would had thought that freezing the fat would work. I had my consultation and decided to move forward. I treated my abdomen and love handles. The session was very comfortable and I had no issues. I returned to work that same day, and the gym that night. Several months later, I remember the day when I noticed that this procedure worked for me! My clothes were loose, my body shape was so much better, actually crazy better! I would recommend glowMD Med Spa and Coolsculpting to anyone! I am so happy!! It works and Janet was great!"